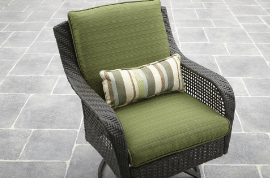 Need to have a seating set for a small patio or balcony, need the comfort of a swivel chair. 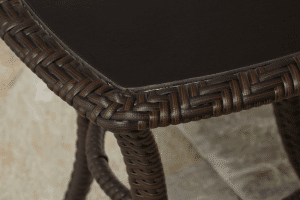 Look no further that the better Homes and Gardens Amelia Cove resin wicker bistro set. Not a true Bistro set more like a chat set with the size of the table, this set is just right for comfortable sitting and relaxing with a friend for few hours with your favorite adult beverage. 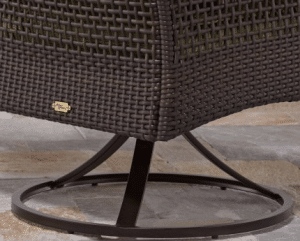 The resin wicker finish will give you the look of a more expensive set costing over $1000, this set will only set you back less than $300. Matching conversation set is available if you have more outdoor space, combination pricing available see link below. Now lets look at the details for this set and see if you can make it work. The one large box will be 29 inches square, 30 inches tall and will weigh a hefty 88 pounds. You will need a large SUV or pickup to get home. The powder coated steel frames will match the dark brown resin wicker material. The chairs will swivel, no rocking motion in this chair unless something is broken. The seat cushion is supported by a steel straps, the center one having the swivel post built in. The chairs are 28 inches deep, 30 inches wide and 36 inches tall. The seat is 23.5 inches wide, 24.5 inches deep and will support 225 pounds. The hunter green cushions and back pillows will have a strip design on the reverse side for changing the look of your bistro set. The cushions are made with a Olefin and polyester cover with a polyester fiber filling. The cushions are 4 inches thick for your seating comfort. Back pillows are 20 inches long, 9 inches tall and 3.5 inches thick. The side table (table is on the small side for a bistro table) will have a smoked tempered glass top insert. If glass is broken, it will be hard to replace the rounded shape of this glass. The table is 19.5 inches square and 22 inches tall. Assembly of your bistro set should take less than a half hour, depending on your skills and having an extra set of hands available. Keep the person who helped you carry the heavy box with a bribe of some kind. The table will require the top to be upside down, attach each leg to a corner. Attach center support and stand on legs for final tightening. Insert glass top and you are ready for that first refreshment, wait for final assembly for indulging too many adult beverages to ensure proper assembly. Each chair will require the seat portion to be inserted into the back portion. Attach one side at a time to this assembly. Insert into base and add cushions, you are ready to relax. Now you are ready for your adult beverage of your choice. Care for this set is just a simple mild soap and warm water mixture. Using any other chemicals, even glass cleaner may damaged the painted surfaces. 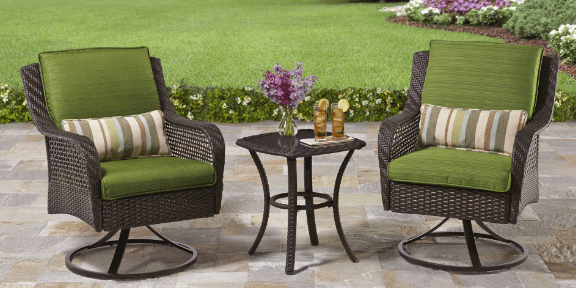 Although this set is listed as a resin wicker bistro set, it has the table size of a chat set. I would have trouble laying out a small meal on this table and the height is rather short for a bistro set. That aside this set will give many hours of great use without any upkeep. The chairs will be very comfortable with the thick cushions and the swivel movements. I would recommend this bistro set for any small seating area for two, if you need more sitting options look at the conversation set details here. If you liked the information in this article, please share with your friends on you social networks. There are some affiliate links in this article, I may make a small commission if you use one. Take your laptop with you and work a little while sipping on your favorite beverage. This will give you good vibes to get extra work done in a relaxed zone.